On the pilgrimage site : Two elevators allow easy access to the three different levels : a "motorised train" is available for the visits of the medieval city and the Alzou canyon. For how many years has the "Dark Valley", this ravine carved out by the river Alzou in the limestone plateau welcomed pilgrims come to pray to mary in one of the many caves in the cliff ? 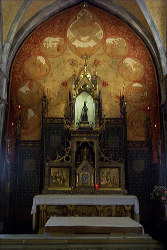 For ages, considering the 6th century bell and the miracles spoken of as far back as the 12th century in the parish of ste marie of Rocamadour. In 1166 a discovery close to the little chapel -the miraculously preserved body of an hermit (therafter named Amadou), Amator of the Rock (he who loves rock) - gave a new impetus to the pilgrimage and inspired the daring construction of 7 churches and a monastery clinging to the cliff-face just above the town. Since the 12th century the Black Virgin with her peaceful, smiling face, with her outstretched hands has "presented" her Son to pilgrims coming from all over Europe, on the way to Santiago de Compostella and now from the four corners of the world. From King St Louis of France, Henri Plantegenet, King of England and Alphonse III of Portugal to the French Minister Edmond Michelet, from preachers such as St Dominic, St Antony of Padua, to sailors such as Jacques Cartier, from Rhenish ministrels to the composer Francis Poulenc, unknown or famous, they all climbed the Great Staircase giving their testimonies of many favours obtained from Notre Dame de Rocamadour in the "Book of Miracles" (12th century), in their own chronides (reports) or by their confidences and let models of boats, plainter's palette, prisoners' chains, cripples' walking sitcks or paintings by way of ex-votos. Today the impressive cliff still invites us to ponder on the meaning of life ; the shrine erched between earth and sky offers pilgrim a marvellous view of the Church and the statue reminds us across the centuries of the tireless prayer of Mary, Our Mother. 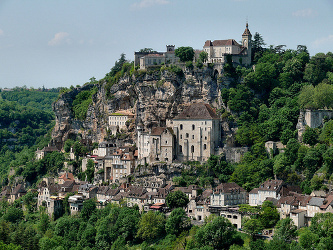 Rocamadour is no ordinary place ; it is a pilgrimage experience, or experience again. In the heart of Quercy region, close to the Dordogne valley, Rocamadour and the vast empty spaces of the Gramat plateau welcome you. Discreet, sometimes secret, but nevertheless ever present, water sculptes the soft chalk rock, carving strange and beautiful sights : Grotto of Marvels (at Rocamadour itself : prehistoric paintings), Grotto Lacave (at 10 km, with its famous' black light') and Padirac Chasme (at 17 km, one of the most remarkable - and famous - grottos in the world). The site of Rocamadour and the sanctuaries are lit up each evening from Palm Sunday until the 11 th of November, as well as for the end of year celebrations. In a circle of 50 kilometers are the towns of Souillac, Figeac, Canors, Saint-Circq-Lapopie, Sarlat... Also close by, the entire Quercy en Perigord regions.